The Foothills Dash celebrated it’s eighth year in the Grand Prix Series. This popular event offers a fast, certified course and attracts runners from all over western Washington. The weather was a little nippy, but there was no wind or rain so conditions were classified as good. The Kent Bowl Grand Prix Series is winding down and eight age group winners for the Series had been declared before today’s race. More Series age group winners would be decided in today’s race. The start was smooth, despite the sizable turnout. Runners and walkers patiently eased through the chip timing arch on the narrow bike path. Several Silver Striders were well positioned behind Robert Bondurant, age 45, who took immediate command of the race. Although the course seemed completely flat, it was slightly uphill going out, making a negative split time on the return a strong possibility. At the finish, Kimmer Muenz was the first female Silver Strider. 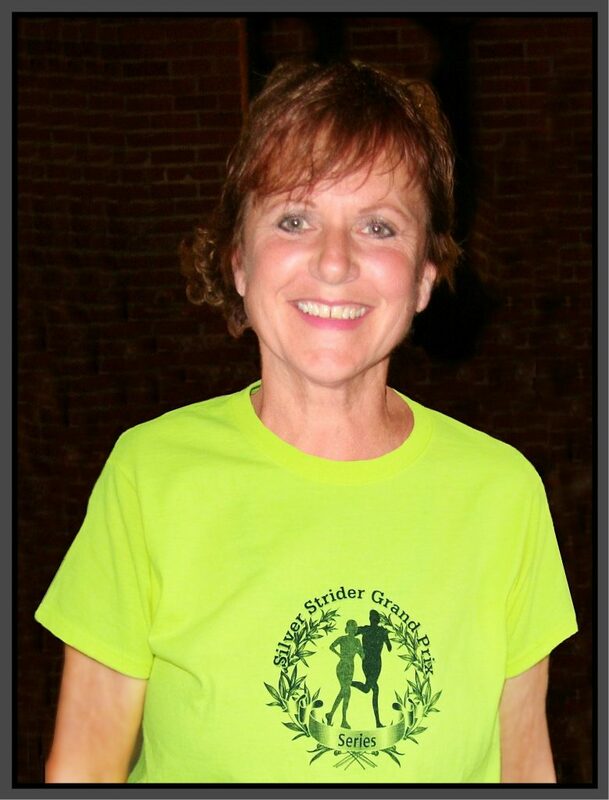 In her last 3 races, she has been the first female Silver Strider to finish. In today’s event, Kim was also 3rd place woman overall. The first male Silver Strider was Tim Oguri, age 67, who finished 2nd overall. Paula Larson, age 51, toured the 5k course in her wheelchair. Wheelchair athletes are sadly missing from our races. We hope that Paula will inspire others to compete, perhaps precipitating a wheelchair division in the future. Three participants became Grand Prix Series finishers completing their 8th series race on the 2017-18 calendar. Jim Dollar, who historically finishes his 8th race at the last minute, finished early this year. He became the 38th Series finisher for the current year. Jim has been a finisher in every Series since it began. Jim was followed closely by Edythe Hulet who was also finishing her 8th race. 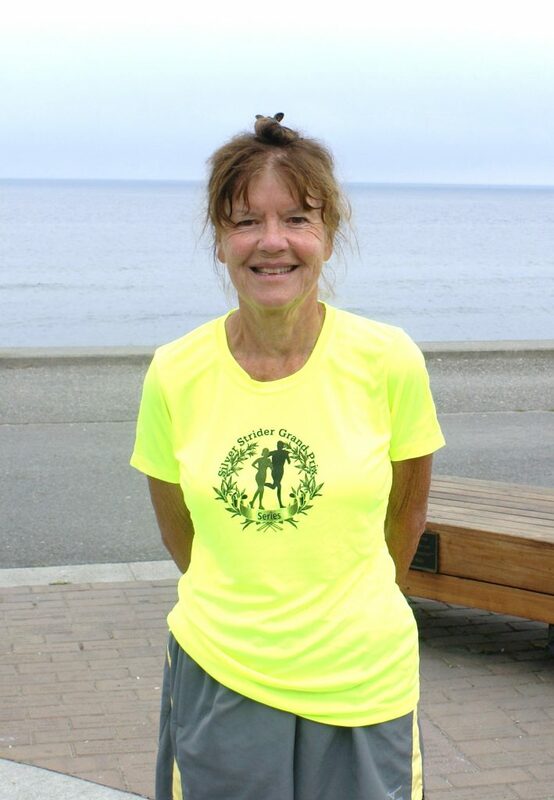 Edythe became the 39th finisher for 2017-18. Also completing her 8th race, was Molly Childs. She has been out with injuries and this race was her first in 2018. Molly became the 40th Series finisher for the current year. Five 2017-18 Grand Prix Series age group winners were decided. 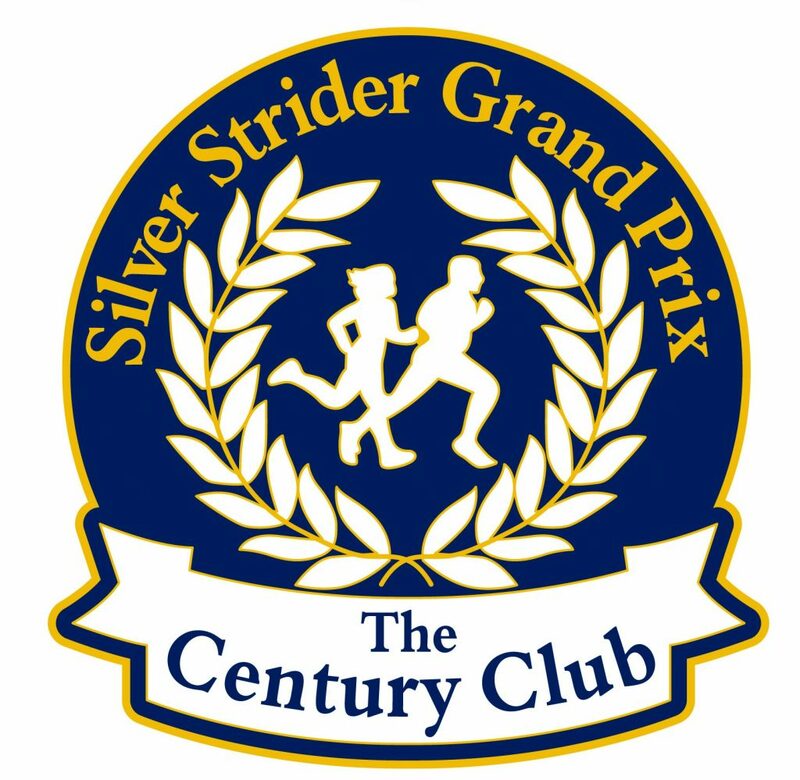 Two Silver Striders finished their 100th Grand Prix Series race and gained membership in the Century Club. Tiare Bailey, who has competed in the Series for 7 years, and Tim Oguri, an 8 year participant (who was having a big day) were the latest additions to the “Century Club Hall of Fame”. Following the race, a surprise birthday party was held for Betty Dietrich who, at age 75, entered a new age group. About 30 Silver Striders gathered at Los Pinos Mexican Restaurant in Orting to celebrate the occasion. The management of the restaurant opened a half hour early for the Silver Strider party. Audrey Kirkwood prepared two of her delicious ice cream cakes to the delight of all present.